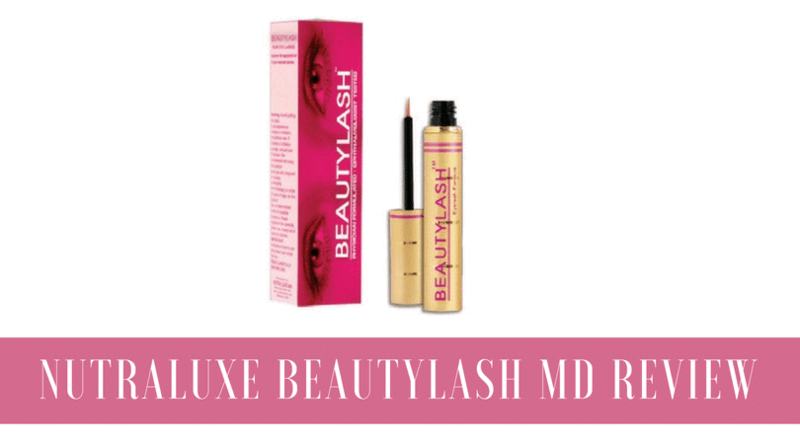 Nutraluxe MD promotes Beauty Lash MD as a physician formulated Eyelash Contitioner that improves the length, fullness, thickness, and the darkness of the lashes in just 4 to 8 weeks. This product is marketed as one that can be used to attain lush brows too. It helps to prevent and even reverse adverse affects to the lashes and brows due to cosmetics and various environmental factors. Nutraluxe Lash MD contains essential vitamins, peptides, and botanicals that replenish, and strengthen the lashes besides augmenting its shine and flexibility. It was released to the masses in the summer of 2008 with the promise of helping the lashes grow to its full potential. Beauty Lash MD is applied like liquid eyeliner on the upper and lower eyelids at the base of the eyelashes once every night before going to bed. The key ingredients of the product include Bio-Peptides that rejuvenates weak lashes and brows, Amino acids protects hair against damage, Sodium Hyaluronate and Tocopheryl-Vitamin E hydrate the lashes and gives them shine and strength, and panthenol increases the flexibility of the lashes. Natural ingredients such as Chamomilla Recutita soothes the sensitive skin around the eyes, Ginseng Root Extract increases the micro-circulation, Grape Seed Extract, a natural antioxidant that prevents free radical damage, and Vitamin C is a strong natural antioxidant that promotes skin repair and protection. It is attractively priced at $35, which is considered on a reasonable side of the price range in comparison with other products in the same bouquet of eyelash growth products. The Scarlet-tinged official website of BeautyLash MD lists an extensive list of ingredients of the product and their uses. The website is very informative and includes FAQ to throw light on various issues concerning the product. Due to the Nutra Luxe MD is affiliate program for BeautyLash MD, chancing upon negative reviews or unbiased customer opinions on the product is next to impossible making it difficult to fathom the true effectiveness of the product. BeautyLash MD is available only online in affiliate sites and the main sales site. It is not available outside in stores. The ingredients present in the product make it more of a conditioner than a growth-promoting product due to the lack of any derivative of active ingredients that are essential to stimulate growth. The before and after photos of users of this product in the various sites promoting the product is questionable. Beauty Lash MD with its competitive pricing of approximately $35, offer of free lip plumper and airy promises of longer luscious lashes and lustrous brows in a short period, and harmless natural hypo-allergenic ingredients that combat breakage and any damages caused by cosmetics and environmental factors camouflages any risk involved in trying the product when compared to its competitors. The result photos in the main site and the affiliate sites do raise questions about its authenticity. It is indeed prudent to take a closer look at the risks involved in using this product before making a purchase decision. Same as the comment above.. worked a little but my eyes were red and puffy, I had to wear alot of eyeshadow and eyeliner to cover and the red still came through.. will not be buying this again! This is the first lash growth serum I have ever used and had good results. My lashes were longer, thicker, and I finally was able to see actual lashes on my bottom lash line, as I didn’t have any before. Although if the product got it my eye it would cause irritation and itchiness. Overall, I really loved the results! I bought this product at my esthetician’s office after I notice how thick and long her eyelashes were. I have been using it for 4 months now and I am thrilled with the results. Before I was barely able to get my lashes into an eyelash curler they were so short. Now they are long, thicker and darker. I wish I had taken before pictures but I was skeptical. If your eyes are red you are using too much product. It only takes a little bit and one dip is good for both eyes. I LOVE this product! I first tried Latisse for a month, but decided I did not want to be committed to a product that was $120 for a month/6wks! My mom told me about this product. My aunt had been using it for months and my mom could not BELIEVE how long her eyelashes were. I found it on amazon for about $35-40….. for a 3 to 4 month supply! I AM TELLING YOU IT WORKS!!!! I get asked frequently if I am wearing false eyelashes! Ha! I bought 6 or 7 tubes of it for Christmas gifts this year! 🙂 If I had to say something “negative” about the product I will say that SOMETIMES my eyelids itch right at the lash line in the morning. Nothing horrible though!! BTW, I have also found that applying mascara on the opposite side of my lashes (instead of on the underside) really helps to accentuate the effect! (AND I am using MAC’s lengthening mascara). At first I loved this product.I work in the beauty industry,everyone noticed how long my lashes were.I told many about it in which they also found great results.After awhile I would just apply beauty lash about twice a week because I started to get swollen eyelids&itchyness w/flakes at my lash line.Just receintly noticed a bunch of lashes fell off or my right upper eyelid.I now have a noticable space on my lash line.I stopped useing the product&the irration has subsided&puffiness went down.I will say when i first stared using beauty lash it was amazing but unfortunatly i can longer use it.Not sure what went wrong&there doesnt seem to be any refrences for any possilble side effects anywhere. I started using this product about a month ago and have not noticed any changes to my eyelashes. I experienced bloodshot eyes for the first 2 weeks so I reduced the amount of product I was using and that has helped. I will continue using it for the next month or so to see if something will happen. WOW – Nutraluxe is truly amazing. I am of Asian descent and it is a known fact that Asians don’t have long lashes! My options up to now were to wear fake lashes or get lash extensions – I didn’t want to do either because of the time/effort and $$ it takes to upkeep it all. I really wanted to enhance my OWN lashes. So I decided to research on lash serums and enhancers. I chose Nutraluxe based on the amount of positive reviews and it seemed to be a solid brand with solid scientific evidence backing it. I ordered online and received it within a few weeks. I started using it immediately and I started noticing a difference within 3 weeks of using the product. I have been using Nutraluxe consistently now for 4 months. My lashes have doubled if not TRIPLED in length. They are thicker, fuller, longer and curl up on its own now – I really don’t even need to curl my lashes. I also now see my bottom lashes as before I barely had any. I am extremely happy with this product because it WORKS! I have not had any side effects at all. Now I really wish I had taken pictures of my transformation!! I have received SO many compliments about my lashes and my family members have asked me what I am doing since they have noticed something different about my face. I told them I am using the Nutraluxe Lash Enhancer! Thank you Nutraluxe for this product!!!! I was using Nutraluxe Lash MD for a couple of days only but got red spots underneath my eyes as an allergic reaction. Stopped using it for a couple of weeks, spots disappeared, tried again, came back. Defintitely allergic, which I am usually not to any creams. For those who have red eyes: you put too much product on your lashes !!! the first 2-3 days my eyes were red to… because i was so excited to have long lashes that i was like: ok let’s go Ã®m puting all the bottle on my lashes !!!! But the secret is to go slowly with this product…I am using it since 5 months now and my lashes are twice long as they were ! But i have noticed the difference after 2 or 3 months of use… !!! and im selling it to all my friends, family and co-workers…they’re all like: WOW, is that your real lashes ??? ?